As Singapore readies herself to seize opportunities in the digital economy as recommended by the Committee on the Future Economy, we need to ensure that small and medium-sized enterprises (SMEs) are not left behind and are at the very heart of our national digital transformation. SMEs represent 99 percent of all enterprises locally and contribute close to half of Singapore’s Gross Domestic Product (GDP). They also provide seven in 10 local jobs. As a company with a mission to empower every person and organisation on the planet to achieve more, Microsoft is committed to helping SMEs realise their full potential through the use of technology. In fact, if there was a single word to describe how SMEs have changed over the past decade, that word would probably be “technology.” In a relatively short period of time, technology has empowered smaller companies to, among others, go from serving only local needs, to tap into global markets; accomplish more throughput with automation; serve customers better through technology; level the playing field when it comes to competing with larger entities; and untether owners and workers from our desk to integrate work and life better. In the last 27 years that Microsoft has operated in Singapore, SMEs here have remained a key focus for us. Just in the last five years, we have reached over 100,000 unique SME customers through over 1,000 business partners, who are often local SMEs themselves. Through the Microsoft BizSpark programme, we have also nurtured more than 1,400 startups since 2008. The opportunities in the digital economy are real. In Southeast Asia alone, the market size is expected to grow to US$200 billion by 2025, with e-commerce accounting for US$88 billion. To accelerate the empowerment of SMEs in Singapore to capture a future economy that will be increasingly digital, Microsoft has teamed up with the Infocomm Media Development Authority (IMDA) as a technology partner under IMDA’s Strategic Partners Programme (SPP) to collectively help Singapore-based technology companies improve their digital capabilities and scale beyond the local market. Through the SPP, Singapore-based technology companies can benefit from having the ability to offer enhanced business offerings – through bundling or adding new applications co-developed using the platforms offered by Microsoft; gain access to domain expertise – by tapping on Microsoft’s expertise in developing solutions and products for global markets; and gain opportunities to scale beyond the local markets – by riding on Microsoft’s robust partner ecosystem and international reach. One such company is Astoria Solutions – a long-time partner of Microsoft, and one of the first ISV partners in Singapore and Southeast Asia to adopt Azure. By leveraging the power of the Microsoft cloud, Astoria has created a series of solutions to help clients in the marine and oil & gas industries increase revenue, raise efficiency and improve workplace safety. An example of their solution is AstorTime,, which is commonly used by companies in the marine and oil and gas industries to track the attendance and performance of large numbers of workers on the ground. This cloud-based solution provides a quick and convenient way of managing a large and diverse workforce, paving the way for companies in these industries to manage their workers more effectively, reducing time taken for paperwork and increasing operational efficiency. Beyond this, we are excited that advancements in technology today is making innovations and transformation more accessible to SMEs. To accelerate the pace of adoption of digital technologies among SMEs, Microsoft and IMDA will work with local technology companies to meet the requirements of the SMEs Go Digital Programme, while providing the SME Digital Tech Hub with access to Microsoft technologies such as artificial intelligence technologies, to support SMEs in their digitalisation journey. 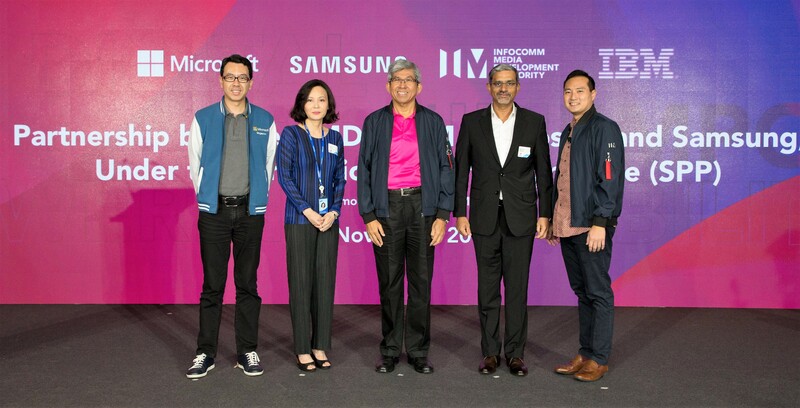 We will also work with them to leverage the Microsoft Azure platform and Microsoft’s expertise in workplace productivity, data and analytics, machine learning and artificial intelligence, and cloud computing, to provide enterprise-grade, cloud-based solutions in sectors such as retail, logistics and food & beverage (F&B), to accelerate digital transformation for Singapore’s SMEs. Richport Technology is a traditional family-owned enterprise that started in 1995, specialising in providing a wide range of electroplating services for companies in the semiconductor, medical, pharmaceutical and aerospace industries. Quality of service is the top priority and a long-standing goal for Richport Technology’s 60-strong workforce, and this mooted the need for the company’s management to look at how they can harness the power of technology to provide better service to their clients. Today, they are leveraging the Microsoft cloud to streamline their business processes, which has then paved the way for the company to take on new initiatives and customers to grow the company. Stories such as these affirm our vision to empower our partners in Singapore to accelerate digital transformation across industries. And with the partnership with IMDA, we believe this will only serve to strengthen the local ecosystem and fast-track our Smart Nation vision to drive inclusive growth across all levels in the society.